The Rubell Family Collection has many Jeff Koons sculptures, one of which is Serpents. The serpents here look like stuffed toys rendered in porcelain. The serpent is a common theme in Koons' work that appeared in the context of the Garden of Eden with Adam and Eve. Here he is taking the serpent out of its biblical context and representing it as a kitschy consumer product. The figures are marked all over with Agrodolce logos. Not sure if this is a logo he made up, or if it exists in reality. 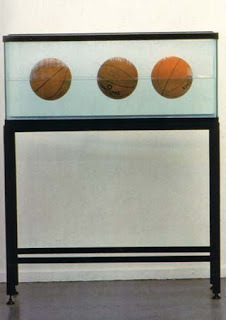 One of his more familiar pieces, Three ball 50-50 tank, is also here. Three basketballs floating in a water tank, immersed exactly at mid-level below water, seem to defy the laws of physics. It gives you insight into the mind of the artist, the conceptualist, trying to figure out a way to defy nature. There is also a Hoover vacuum cleaner and an inflatable flower, other examples of kitschy objects for which he is well-known. He is trying to deceive the viewer's perception of an everyday object, like a vacuum cleaner, by presenting it as a piece of art. He is influenced by marketing and advertising. You can see how when you look at these pieces.